Arizona's eclectic folk rock powerhouse Calexico are working hard on a new album but, after being left without a label, aren't yet certain who will release it. 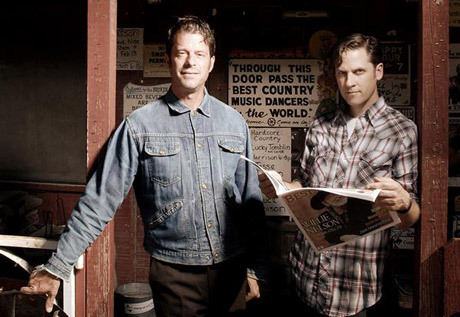 Long affiliated with Touch and Go Records offshoot, Quarterstick, Calexico were one of many artists looking for new imprints when Touch and Go announced it was downsizing its operations in the winter of 2009. At the same time, the band's profile has risen; their reputation as one of the most tasteful and talented group of players led them to collaborate with Willie Nelson on the I'm Not There soundtrack, and they actually appear as a back-up band in Todd Haynes's surreal Bob Dylan biopic. Similarly, their last record for Quarterstick, 2008's Carried to Dust, earned rave reviews and widespread attention. One label that seems eager to get into the Calexico business is Anti- Records. At their recent stop at the Hillside Festival in Guelph, ON (where the band played several, exciting new songs), drummer John Convertino told Exclaim! that Anti- was a likely destination for the next Calexico album, but added that nothing was confirmed yet. In discussing Anti- album Li(f)e, rapper Sage Francis recently told Exclaim! that label head Andy Kaulkin was responsible for calling in favours from friends in curating the diverse guest list of collaborators on the record, and Calexico are prominent among them. Today (August 6), Calexico will play the Edmonton Folk Festival and will visit the Regina Folk Festival this weekend, followed by another Canadian stop at the Ottawa Folk Festival. A full list of dates are below.